When you are in the market for a new vehicle, you want to be sure that the vehicle you are investing in is capable of complementing your needs on the road. That is especially true if you are in the market for a family vehicle. That is where the 2019 Chrysler Pacifica Hybrid comes in. Here at Larry H. Miller Chrysler Jeep Dodge Ram Albuquerque, we are proud to help drivers find a vehicle – whether that’s a sedan, a truck, or an SUV – that is best suited for their budget and their needs on the road. For those drivers who are in the market for a reliable SUV with impressive performance capabilities, we invite you to check out the 2019 Jeep Grand Cherokee. Dodge vehicles are different from other cars in a multitude of different ways. Most importantly, though, Dodge vehicles offer you a newfound level of power and confidence on the road. No matter what kind of vehicle you are looking for – sedan or SUV – we can help you schedule a test drive with your favorite car on our lot. Need a Smart Minivan? This One May Be Right for You! Many of the people who visit us are in the market for a vehicle that complements their family needs. 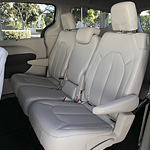 That is why we have a vehicle like the Chrysler Pacifica Hybrid, which not only delivers the spaciousness you need, but also a host of cutting-edge features that help set it apart from other cars on your lot. When you're considering your options for a light-duty pickup truck in Albuquerque, don't look further than the 2019 Ram 1500. With a variety of features that can be added and customized, you'll be able to drive the right truck for your specific requirements. Bold designs are combined with advanced aerodynamics to create an exterior that is both functional and beautiful. 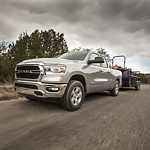 With an active grille that can control engine temperature while increasing aerodynamics at higher speeds, the Ram 1500 combines the best of all worlds. At Larry H. Miller Chrysler Jeep Dodge Ram Albuquerque, we’re excited to show you all of the great interior features of the Jeep Renegade. You can enjoy a lot of space, technology, and comfort. No matter how long your trip is, you’ll love what this vehicle has to offer. Some of the common complaints about vehicles even from people that love to sing praises of different vehicle types is that they tend to be uncomfortable. Also, seats are hard to access in some cases. Our Larry H. Miller Chrysler Jeep Dodge Ram Albuquerque staff would hear about these complaints from time to time. Fortunately, those concerns were addressed with the 2018 Chrysler Pacifica. Dodge has been manufacturing the Challenger since 1970. It made jaws drop back then when it first came out. The design and performance of this vehicle is still impressing consumers to this day. 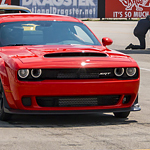 If you are someone that loves to hear a massive engine growling as you drive, you have to get behind the wheel of the current Dodge Challenger model. We have a number of different trim levels on our lot, each with its own unique engine option. The Dodge Durango Should Be Your Next Car. Here's Why. When you begin looking for a new car, what do you search for? Do you look for something spacious? Do you search for a vehicle with ample cargo space? Do you seek out something that looks great both inside and out? When you begin looking for a new car, make sure you consider the Dodge Durango. Here's why. When driving, you need as much information as you get so that you can keep safe. Fortunately, the Chrysler 300 is able to provide you with the information you need while you are on the road. It also has features that make it easier for you to control your vehicle. One feature of the Chrysler 300 is the driver information digital cluster which provides you with real-time information about your vehicle and the environment you are driving in. Larry H. Miller Chrysler Jeep Dodge Ram Albuquerque is proud to provide the Santa Fe and Los Lunas areas with an incredible selection of new Chrysler, Jeep, Dodge, and RAM models as well as used cars, trucks, and SUVs. Give us a call or stop by today for an outstanding car-buying experience.